This is a listening lesson for high B1+. I designed this lesson for my DELTA receptive skills assessed class. It’s based around a listening text from Speak Out Upper-Intermediate (Pearson), in which a woman describes how she had her bag stolen while sitting in a café. I chose this text because this type of crime is an extremely common occurence here in Barcelona. 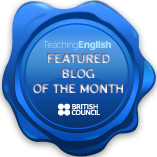 Below you can download the lesson procedure, students’ and teachers’ handout, an annotated version of the transcript and the listening file. The most important thing to bear in mind is that this is a class which focuses on developing students’ listening skills rather than simply testing their comprehension of a text so feel free to replay sections of the text as many times as it takes for them to get the message. It’s important to follow the steps as laid out in the procedure. The pre-listening tasks, in which students make predictions about what will happen next, aid students in their comprehension as they are given the opportunity to apply their own knowledge and experience to the text. After listening the language focus section on connected speech will help students to identify and decipher fast connetced speech, for example, the pronunciation of past modals “can’t/must/might have”. I’m currently working on my grammar assessment class in which I will come back to past modals of speculation. It should make a good follow-up class to this one so watch this space. The audio file no longer works, could you please reupload it?